The purpose of the development of Virtual Airway Skill Trainer (VAST) is to provide a safe training environment for clinicians to learn the airway management techniques without risk to actual patients, standardize the process of skill training and allow automatic quantification of performance. The virtual simulator, equipped with visual as well as haptic interfaces provides an immersive environment that enables the users to touch, feel and manipulate virtual anatomies. We use Oculus Rift for immersive visual display to simulate operating room experience. Furthermore, to determine the critical procedural steps in airway procedure and metrics for assessing users’ performance such as operation accuracy and tasks completeness, we have conducted a hierarchical task analysis. A procedure in which an incision is made in the skin and cricothyroid membrane to establish a patent airway during certain life-threatening situations. 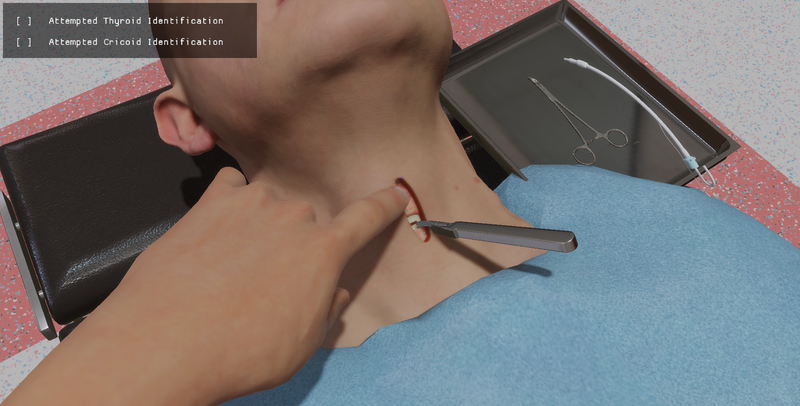 Five major tasks for CCT procedure are identified and implemented in our simulator: landmark identification, skin incision making, cricothyroid membrane incision making, membrane dilation and Intubation. The endotracheal tube is inserted through the mouth into the trachea with the use of laryngoscope. The ETI procedure is divided into four main tasks: assessing the airway of the patient, placing the patient in the intubation position, insertion of direct laryngoscopy blade and intubation.